Tourism Matters | News | Opinion | Discussion | Advice | Innovation | Development: Google Hotel Finder - Levelling the Playing Field? Google Hotel Finder - Levelling the Playing Field? Some of you may have had a wee look at Google’s Hotel Finder which was launched in test format last week in the United States. A quick trawl through its functionality and you can't help but think that it's going to be good for the consumer and the hotel and may just offer a way of pushing back those expensive OTA commissions. Of course that may change but HotelMarketing.com's Markus Busch at least thinks it has the potential to disrupt the business of online bookings. 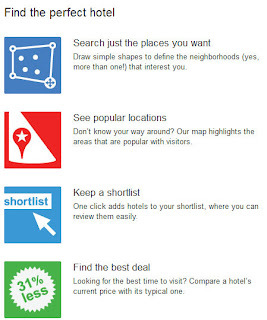 Simply type in Google Hotel Finder and up it will come. As you'd expect from Google the process is simple and fast allowing you to compare and book hotels without leaving the Google Hotel Finder page. 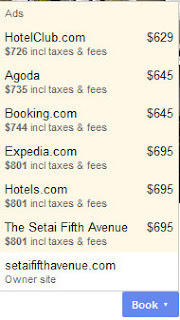 Select by Hotel and user rating, Price, check in dates and obviously powerful Geo location tools. According to Busch, "For the hotel industry, Google Hotel Finder has the potential to become a new level playing field where hotels can compete with online travel agents and have an equal change to succeed in securing the final booking. A powerful catalyst for driving direct bookings via your hotel website. Hotel destination search how it was meant to be"
And we have to agree, before Google Places was launched, if you searched for “hotels in Edinburgh” on Google, your search result page invariably was saturated with not a single link to a hotel website, but loads of links to a proliferation of online travel agents and their affiliates. Hotels trying to get a page one listing were often up that creek with that paddle. Google Places and maps shifted that balance a little but with the heavies of Booking.com, Tripadvisor and others dominating the paid and unpaid listings. The effects of this have become clearer and clearer with the previously forecast shift to hotels' increasing direct sales slowed by the sheer buying power of the OTA's and a slewing of traffic towards third parties. Google's Hotel Finder has the ability to change this - when it hits Scotland (sooner rather than later we hope!) the consumer will enter Google Hotel Finder, type in the city and their dates of travel and hey presto all you're going to get is a list of hotels relevant to your search. No OTA's just hotels! If you use New York as your example for now, you can see that the initial list that comes up features hotels with an image, the hotel name and a description. It also includes the hotel’s star and user rating, and a price per night which sits alongside a value percentage against the historical average price. Each hotel entry can be expanded out with a single click with more images and a slide show, reviews, contact details and a link to the hotel's own website! And that's where the balance starts shifting back to the hotel! You can now scroll through the hotels and select the ones you like for comparing in your own shortlist at the top of the page. Once you're ready you just hit the Book button which opens up a neat little price comparison box with featured OTA's and most importantly another link back to the hotel to book direct. Hotel class & User rating: Select your preferred hotel class from one to five stars, and if you would like to see only hotels that have reviews. 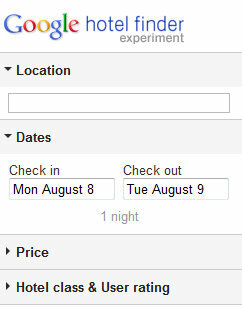 According to HotelMarketing.com, the Google Hotel Finder experiment raises a few questions. They ask the following. How do hotels get listed on Google Hotel Finder? What databases are accessed via Google technology to populate the hotel listings? They argue that it is most likely to be CRS content provided directly by hotel representation companies like Sabre Hospitality, Utell and the likes, or Pegasus ODD. I'm pretty sure that Google will find an alternative solution that will open up the option for independent and smaller properties to be found. Some form of booking integration interface is not beyond the realms of Google Places and puts the responsibility back in the hands of the hotelier. If hotels can get to grips with UA Codes in Analytics then surely they'll work something out through Places for Business! 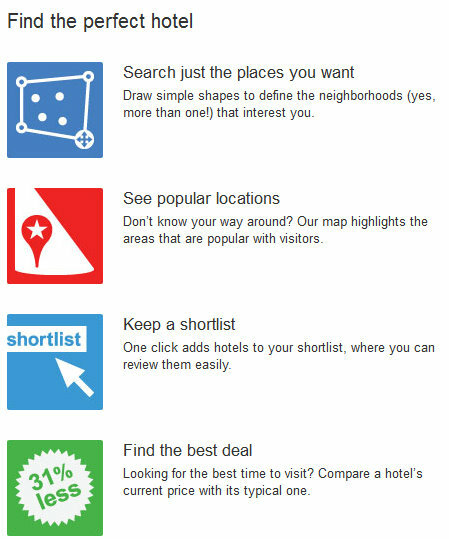 They also ask "How will hotels get ranked on Google Hotel Finder? Currently the result page is static, with the same hotels getting the top position on the list. Will that change into a randomly sorted list for the final product? Where does the static content for the hotel listings like hotel descriptions and images come from? And how can hotels update that information? What role does Google Places for Business play when it comes to updating a hotels business information on Google Hotel Finder?" From a Scottish tourism perspective it can't surely be a bad thing to have the possibility that individual hoteliers may actually see a day when there pricing and availability decisions are moved back into their own hands again. The current situation where Scottish hotels are having to compete with the OTA's to bid for their own hotel brand names is for many quite ridiculous and has in the eyes of many moved their distribution channel from partners to competitors. It must also have an impact on the search and web development strategies of Destination Management/Marketing Organisations - what for example do VisitScotland.com do with Google Hotel Finder? Is it not clearly the dynamic solution to the recurring online booking problems that they are spending a small fortune to develop? At this stage at least you have to say that Google Hotel Finder looks positive for the hotelier and the guest looking to book direct.